Premier woven wood shades add elegance to any window you have. Like fine furniture for your windows, premier woven woods will dress up any room. The materials used to manufacture our woven wood shades have unique color and variations in colors and texture to add beauty to every shade. The characteristics of Natural Woven Woods allow for variances in color, tone and texture from the sample swatches. The size and shapes of the slats will vary and are not considered defects. Spacing of the slats will vary over time. Due to the natural characteristics of woven wood, certain fabrics may shrink or stretch with changes in temperature. Slight color variations are normal and may change over time and are not considered defects. Each shade is considered unique and original. For complete privacy or light blocking it is strongly recommended that you add a liner to the shade. Blinds Chalet recommends edge binding to prevent string from fraying. On outside mount shades edge binding will add up to 1/4" in width. W: 10" 11" 12" 13" 14" 15" 16" 17" 18" 19" 20" 21" 22" 23" 24" 25" 26" 27" 28" 29" 30" 31" 32" 33" 34" 35" 36" 37" 38" 39" 40" 41" 42" 43" 44" 45" 46" 47" 48" 49" 50" 51" 52" 53" 54" 55" 56" 57" 58" 59" 60" 61" 62" 63" 64" 65" 66" 67" 68" 69" 70" 71" 72" 73" 74" 75" 76" 77" 78" 79" 80" 81" 82" 83" 84" 85" 86" 87" 88" 89" 90" 91" 92" 93" 94" 95" 96" 0/0"1/8"1/4"3/8"1/2"5/8"3/4"7/8" H: 12" 13" 14" 15" 16" 17" 18" 19" 20" 21" 22" 23" 24" 25" 26" 27" 28" 29" 30" 31" 32" 33" 34" 35" 36" 37" 38" 39" 40" 41" 42" 43" 44" 45" 46" 47" 48" 49" 50" 51" 52" 53" 54" 55" 56" 57" 58" 59" 60" 61" 62" 63" 64" 65" 66" 67" 68" 69" 70" 71" 72" 73" 74" 75" 76" 77" 78" 79" 80" 81" 82" 83" 84" 85" 86" 87" 88" 89" 90" 91" 92" 93" 94" 95" 96" 97" 98" 99" 100" 101" 102" 103" 104" 105" 106" 107" 108" 109" 110" 111" 112" 113" 114" 115" 116" 117" 118" 119" 120" 0/0"1/8"1/4"3/8"1/2"5/8"3/4"7/8"
Does the Premier woven wood shade come with a vailance and what length, and is this shade a fold up as oppose to a roll up? The Premier Woven Woods come with a 6" self valance, and folds up like a roman shade, opposed to rolling up. I was impressed with the quality and look of my shades for the price I paid. I was impressed with the quality and look of my shades for the price I paid. I love the way they look. I also received them very quickly. I ordered the Premier Woven Wood Shades "Santos Forest". I ordered the Premier Woven Wood Shades "Santos Forest". The quality of the material and construction is superb. This is a very attractive shade. I especially like that during the day, I can see the outside through the closed shade, but can't see the inside from the outside unless my face is right against the window. Installation was simple and easy, I would judge my "diy" skills as a five out of ten. I would recommend ordering a sample first, my monitor's color wasn't an exact match for the color. Great service. Blinds were easy to install and very good quality. Thank you! We got our order sooner than anticipated which was wonderful. We got our order sooner than anticipated which was wonderful. They were perfect in every way and were stunning. So much so that I just ordered the same shades for the rest of the house. At these prices you can't go wrong. I looked at other companies to purchase from and they were so much more expensive and didn't have half the selection. The customer service people were on top of there game and had all the answers and suggestions you could ever need when trying to make your decision. I will definitely be telling me friends. Thanks so much and in case you couldn't already tell - I LOVE THEM! Edge Binding are cloth tapes that are wrapped on the edge of the shades to help prevent fraying as well as adding an elegant look to the shades. Our standard edge binding is 1 1/4" wide with approximately 1/2" of fabric showing on each side of the shades. Add additional privacy and block the light by adding this upgrade to your shades. Our standard blackout liners offered in white. 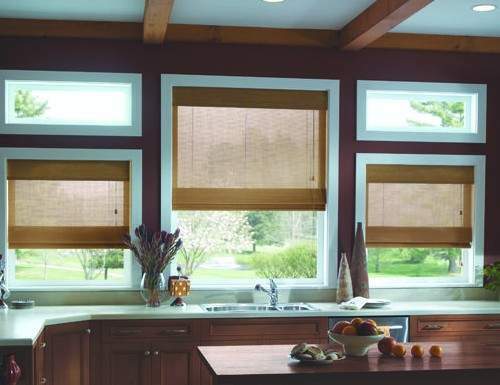 Add additional privacy and light blockage to your shades by adding this upgrade to your shades. If no option is given, the default color is a white privacy liner when this upgrade is selected. Upgrade to a thicker edge binding on our woven wood shades. Our wide edge binding is twice as thick as our standard width showing more fabric and color.